So Lonely in Gorgeous: The Ugly Side of Beauty...Cleaning Brushes! 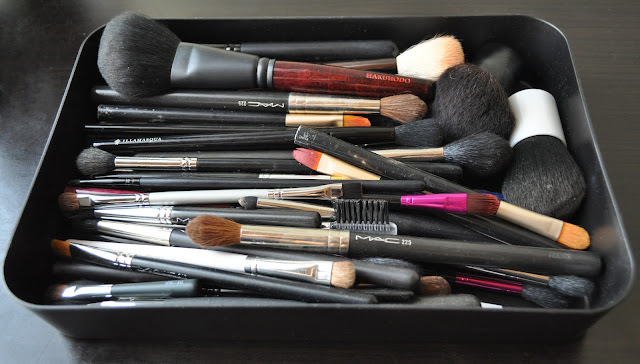 As much as I love (ok, I'm obsessed) makeup, makeup brushes, and applying makeup, I often (always) dread the painstaking task of cleaning my brushes...I think that's why I own at least of six of each brush. Guess you know what I'll be doing for the next few hours this evening. I used to use baby shampoo to deep clean my brushes and the Hakuhodo brush cleanser for my hakuhodo brushes, but I've switched to only using the Hakuhodo cleanser. 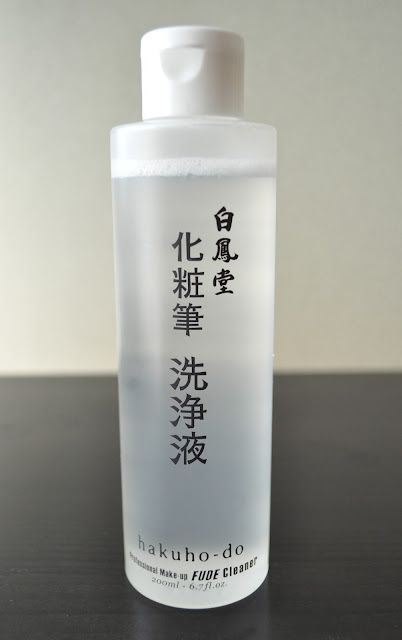 The Hakuhodo cleanser retails for ¥ 1,500 (6.7 fl. oz./ 200 ml); you only need a tiny amount of liquid to clean your brushes. I love how soft, shiny and conditioned my brushes feel/look after using this cleanser. If you want to ensure the longevity of your brushes, I highly recommend investing in this cleanser. 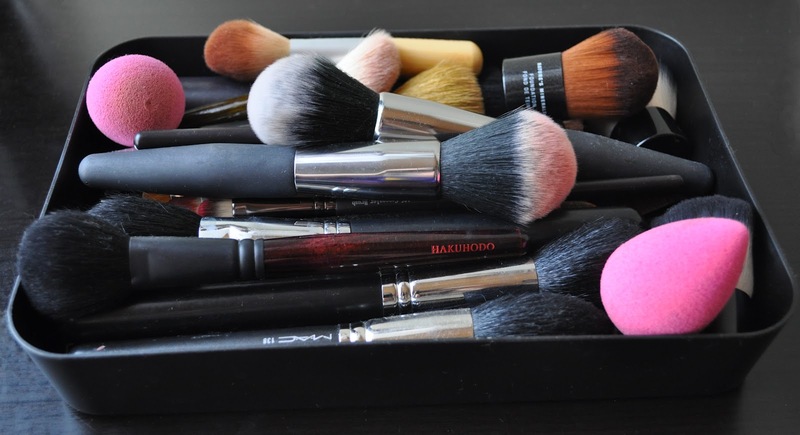 Your brushes will thank you for it!! You do need to rinse it out with water. I don't use the mac cleanser for deep cleaning, just spot cleaning. I've never used Clinique's brush cleanser (I'll have to try it), but another cleanser I really like is the one from Blender Cleanser from Beauty Blender. I'll wash ALL your brushes for you......just PLEASE tell me more about that gorgeous looking Hakuhodo brush with the mottled looking redish/black handle & the matte ferrule. That brush is sooooooo missing in my collection. Do they have a whole range with that handle & ferrule? Do NOT tell me that it was limited because I WILL cry!! Which brush do you want to know of, There are two different kind of reddish/black handle hakuhodo brushes in both pictures. I hate to drop a bomb on you, but these brushes are only sold at the store in Aoyama. You would die if you went to that store!!! They have the Largest select of Hakuhodo brushes in all of Japan. The brushes you see on the Hakuhodo international site is but a fraction of what's available. You need to come visit me darling!! Yup, there's a whole lot more! Question Buggsiebee, what made you move to Germany? Were you born and raised in Japan? Your english is so fluent that I'm thinking it must be your mother tongue? But I had been traveling throughout Japan way before ever meeting Aki (my man). How long have you been living in Germany? What's it like? We need to do a Q & A!!! Also, do you have a blog? OMG ...never.., I'm waaaaaaay too undisciplined to have a blog! How long have you been living in Japan? Learning Japanese can't have been easy?!! Hahaha, that's a shame, I think you're blog would be amazing! Wow, 19 years! I'd love to hear more about South Africa and Germany. Woman, we need to Skype! I've always wanted to visit Germany. I totally agree with you, nowhere is perfect. Japan can be a very tough country to live. Don't get me wrong, I love it here, but there are definitely cons to go with the pros...maybe I should write a post on that??? I've been living in Japan for four years, and although I can speak the language, I'm not 100% fluent yet. And yes, Japanese is one of the most difficult languages to learn, and don't get me started on reading all the characters. I don't got no Skype;) It drives me crazy when my mom uses it to call me because it's always breaking off or I have to answer the phone about 4/5 times first before a connection is finally made. I imagine that the connection to Japan is easier than to SA though. Poor you:( Is there any way that one can actually learn those Characters except parrot fashion? Perhaps one learns a few basic characters and they are like building blocks to build up more complicated characters? I just can't begin to imagine how one would learn them because they make zero sense to the western eye. What r the 2 round top face brush in the 1st pic? Their from the Kirkland by Borghese brush set that I got at Costco last year.